John Blachford born 1682, the fourth son of Captain Robert Blachford and Elizabeth (née Mann) of Sandhill Manor, was baptised at Fordingbridge on 18th April, 1684. At the age of eighteen John was sent to London, a long and tiresome journey by coach, where he was probably met by relatives, who we know ,were established in the trade and commerce of the in the city. In the apprenticeship register of the Worshipful Company of Goldsmiths of the City of London, this entry appears : "March 17th, 1700, Memorand that I, John Blachford, son of Robert Blachford of Fordingbridge in the County of Southampton, Gent, Do put myself Apprentice to John Carlitch citizen and Goldsmith of London, for the term of seven years from this day". signed, John Blachford. John prospered in his profession and gained his "freedom by service" on the 16th March, 1710; a period much longer than the seven years he envisaged. The Company has no record that he ever registered a makers mark at the Assay office, so probably he was not a working goldsmith in his own right, but became a retailer of precious metals. At this time he lived in Silver Street not far from Goldsmith's Hall where the headquarters of the worshipful Company still stands. In 1744 he became Prime Warden of the Goldsmith's Company, the most highly respected position among the members of his craft. In the meantime John had been taking an active interest in Civic affairs, and on the 9th May, 1743 he was elected Alderman for the Cripplegate ward of London. He served as a Sheriff in 1745/46 and his name appeared with those of the other Aldermen on the dedication panel of John Rocque's map of London published in 1746. On the 18th of August 1746, John Blachford was one of the Sheriffs present at the executions of Lord Kilmarnock and Lord Balmerino (a fact that appears to be out of keeping with John's professed sympathies with the Jacobite cause). The executions took place on Tower Hill, and the instrument used was the axe. John was not the only City Alderman who favoured the Jacobites, and he associated in particular with five others whose names also appear in the dedication panel, and who all became Lord Mayor (William Benn, Sir Henry Marshall, Thomas Rawlinson, Robert Alsop, and Edward Ironside). 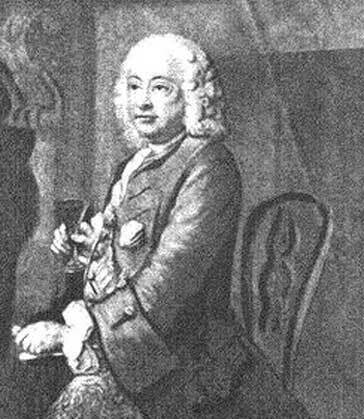 In 1728 John Blachford bought the Manor of Bowcombe near Carrisbrooke in the Isle of Wight, and in 1746 he and his friends named above assembled at Bowcombe, and had their portraits painted by Thomas Hudson (a well known artist of the time) seated round a table drinking wine from long stemmed Jacobite glasses; doubtless the occasion included drinking of a toast to the young pretender across the sea. The painting, a very large one, which became known as Benns' Club, was presented by John to the Goldmsiths Company in 1752. It hangs to this day just inside the main door of Goldsmiths Hall in Foster Lane, where it fills one wall of the entrance hall, and may be seen by any visitor. Bowcombe or Beaucombe; the name means a pleasant valley, was the old name of Carrisbrooke Parish. Bowcombe Manor lies on the south east side of Bowcombe Down amidst the range of hills to the west of the Medina river. To the north east is Clatterford pleasantly situated within the shadow of Carrisbrooke Castle near Lukely Brook and the mill race. Bowcombe Down, its sides covered with the trees of Row-ridge and Monkham in the west, and Bowcombe woods to the east, with its ancient road track the site of an Anglo-Saxon cemetery and Tumuli, is a magnificent walking ground. In 1750 jail fever (now identified as typhus) struck again, having been brought into court by prisoners, and as a result the Lord Mayor, two judges, an Alderman, an under sheriff, and fifty or sixty court officials died. John Blachford was made Lord Mayor for the remainder of that year. Wednesday 23rd May, 1750 At a court of Hustings held at Guildhall for electing a Lord Mayor for the remainder of this year in room of Sir Samuel Pennant deceased, Sir John Barnard, father of the City in the chair. John Blachford and Francis Cockayne esq. were returned by the common hall to the court of Aldermen, who chose John Blachford esq. After this the Lord Mayor elect entertained the court of Aldermen at the Goldsmiths Hall where he keeps his Mayoralty, and at eight o'clock in the evening he was presented by the court of Aldermen to the Lord Chancellor at Powis House, who approved of their choice. Friday 25th May, 1750 The new Lord Mayor who was sworn in at Westminster, to which he went in the City Barge attended only by the Goldsmith Barge. The ceremony was deliberately low key in respect to the tragic death of his predecessor. There were no formal property qualifications for Lord Mayors at that time, but they were almost without exception men of wealth, and they were expected to hold property to the value of at least £15,000. City Aldermen were frequently connected with the aristocracy or were bankers, directors of moneyed companies or large holders of Government stock. In February of 1739/40, John had been elected a governor of the Foundling Hospital recently established in Lamb's Counduit fields by captain Thomas Coram as a home for exposed and deserted children. John became a governor of Saint Bartholomew's Hospital, and in the elected President's absence abroad, was made temporary President on the 13th of June, 1751. When the elected president died, John was elected president of the hospital on the 8th of February, 1754, and remained so until his death.His name appears with others inscribed on panels in the great hall of the hospital as having donated £200 towards the cost of new building carried out around the middle of the century. Those giving £50 or more were made governors. Monday the 14th July, 1755 A jury of Freemen of the company of Goldsmiths of which Mr. Alderman Blachford was foreman, met at Goldsmiths hall to make an assay or trial of the pix, or standard coin of the nation, (coined in the Tower of London between 1750 and that day) and went from thence to Whitehall to make their report to the Lord Chancellor - on which occasion several Lords of the Council and chief officers of the state were present. The Lord Chancellor, having given an excellent charge to the jury, withdrew with the rest of the Lords. Upon the trail the jury found all the coins in weight and fineness perfect standard and reported them so accordingly. There is an old farm at Hartgrove (otherwise Black Venn) in the Fontwell Magna parish, once known as Blachford farm, recently renamed to Blackberry Farm. Probably the farm of John Blachford the farmer of Shaftesbury. The last years of John Blachford, Goldsmith, and Lord Mayor of London were lived at NORTHAW where he eventually passed peacefully away. "Here lie the remains of John Blachford esq. Citizen and Goldsmith of London late Alderman of Cripplegate Ward and President of St. Bartholomew's Hospital who, having successively enjoyed the supreme offices in that great City filled them all with dignity and honour equalled by few, excelled by none. He died in the Parish universally lamented 27th September A.D. 1759 in the 77th year of his age." John Blachford's tombstone can no longer be seen in the church at Northaw. It may have been removed when the church was damaged by fire, and rebuilt in 1881. Where is it now, if it still exists, is not known.